Teams should consider their season a success if they learned something new and had fun in applying their knowledge and skills to the VEX IQ Challenge. Events provide a great opportunity to share and recognize the accomplishments and contributions of the student participants! 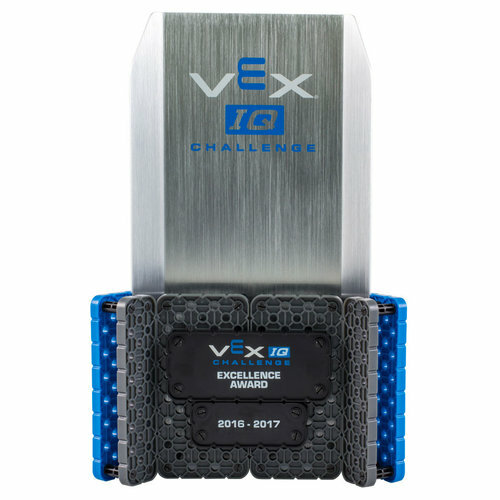 This section details the full list of awards presented in the VEX IQ Challenge Program. Most local and regional events will offer a small subset of these awards, based on the number of teams at their event. The only event likely to present each and every one of these awards will be VEX Worlds, as warranted by the hundreds of teams participating. The awards presented at each event are chosen by the event planning committee with the help of their Regional Support Manager. A full list of the awards that may be presented are detailed at http://www.roboticseducation.org/documents/2014/06/vex-iq-challenge-awards-appendix.pdf. Below are the awards that are typically awarded each year. Engineering Notebook is a clear, complete, and organised document of the robot design process. Team demonstrates effective management of skills, time, and material resources. Students understand and explain how they developed an effective game strategy and robot design. Students demonstrate teamwork and effective communication skills. Judges will use the Design Award Rubric to evaluate the teams’ performance on the award criteria. The first part of the Design Award Rubric is used to evaluate the quality of a team’s Engineering Notebook. The second part of the rubric is then used to evaluate the students’ understanding and application of an effective robot design process, as demonstrated in their team pit interview with Judges. The Design Award Rubric is available in the Judge Guide and at roboticseducation.org/event-partners/event-partner-resources-documents/. The Teamwork Champion Award is presented to each of the two teams on the winning alliance in the Teamwork Challenge Finals Matches. Students demonstrate teamwork and effective communication skills Additional details on the STEM Research Project, including the STEM Research Project rubric, are available at: roboticseducation.org/competition-teams/vex-iq-challenge/. The Robot Skills Champion Award is presented to the team with the highest combined Programming Skills Challenge and Driving Skills Challenge score. A team’s combined score will be determined by adding their highest Programming Skills Challenge score and their highest Driving Skills Challenge score at a single event. Teams participating in only one of the two skills challenges will receive a zero score in the challenge in which they did not participate. Some events may choose not to offer this award. The Judges Award is presented to a team that the Judges determine is deserving of special recognition. Judges consider a number of possible criteria for this award, such as team displays of special attributes, exemplary effort and perseverance at the event, or team accomplishments or endeavours throughout the season that may not fit under existing awards, but are nonetheless deserving of special recognition. The Inspire Award is presented to a team that has inspired judges with their STEM Research Project presentation. This team will effectively communicate their passion for STEM and maintain a positive attitude throughout the presentation. The teams stem presentation will have impressed the judges.